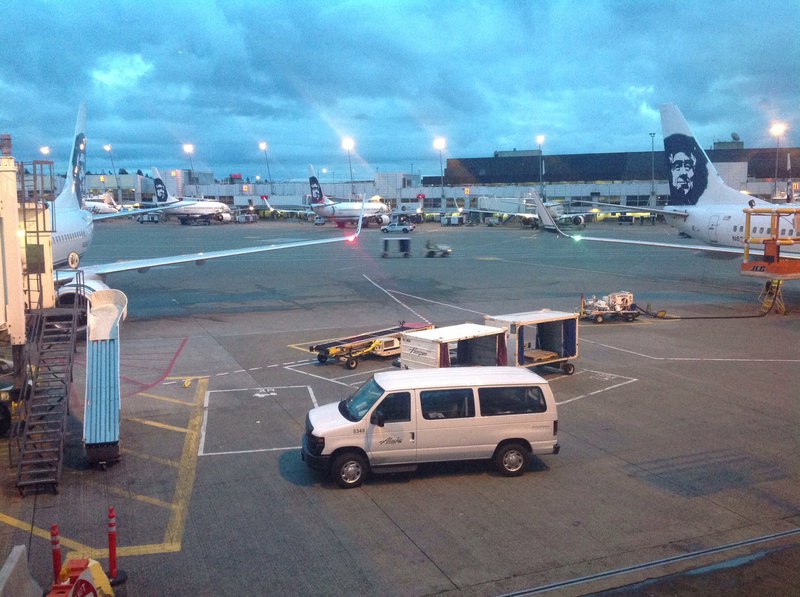 Sitting in the SEATAC airport again after arriving on the red-eye out of Anchorage. We are continuing on to Philadelphia, PA, later this morning so that my wife can be with her father to celebrate his 90th birthday. Then we go off in search of warmer weather. We are thinking of Savannah, GA, or maybe even somewhere further south. The temperatures along most of the Atlantic coast doesn't seem a whole lot warmer than back home. I think the rough schedule is to drive him down to Virginia on Monday, then spend time with my wife's side of the family for a couple of days. Then we check the weather and head for somewhere that doesn't resemble Alaska. Saturday Evening - Today was one of those flights where things went wrong. Of course, this is right after I mentioned that there have been very few delays or cancellations with Alaska Airlines in Barrow. There was a mechanical delay in Seattle due to fumes from the baggage compartment making their way into the cabin. They ended up cleaning something up but didn't say what it was. But they did remove all of the luggage, passengers and crew. When we got to Philadelphia, we found out that our luggage had made a detour to Minneapolis and is supposed to be delivered to the hotel tonight after arriving on a Delta flight. Hopefully, it makes it. The hotel is one that I had reserved on hotels.com just a short way between Philadelphia and Hershey and it turned out to be an incredible value. The bargain priced room is actually a very nice suite with a fully outfitted kitchen including a dishwasher. Maybe popular with business folks during the week but the place is almost deserted today (Saturday). Due to the flight delays, we didn't get our rental car until after dark and I don't really enjoy driving on these narrow roads after dark. Update - The missing luggage was delivered to the hotel at 1:50AM. Apparantly the luggage didn't care for Minneapolis. I hope the weather will be playing along. But it can't be as nasty as your temps up in Alaska, can it? Enjoy your trip! We figured that as long as we can avoid a winter storm, we'd be ahead. So far, not even a single snow flake spotted! It is very frustrating when you luggage decides it wants a trial separation. If apart for too long, you eyes begin to wander to other, new possessions. I think my wife's response was simply "shopping". So we weren't very stressed by this and figured that the luggage would eventually catch up. Wow, you have had a time of it so far. Sure hope the rest of the trip is smoother. Go for and visit and find sunshine. And happy Birthday to your FIL. Richard, sorry your luggage wanted to spend time at MSP; it's not all that great of place. Hopefully things will smooth out for you. Enjoy your time away and happier flying! I hope the luggage enjoyed the stay. Our flight was direct from Seattle to Philadelphia so I'm not sure why there was a detour. Have safe journey and enjoy! Thanks! Even at 32°F, it's still way warmer.